This is a pretty hillside course. Water comes into play on 11 out of 18 holes. 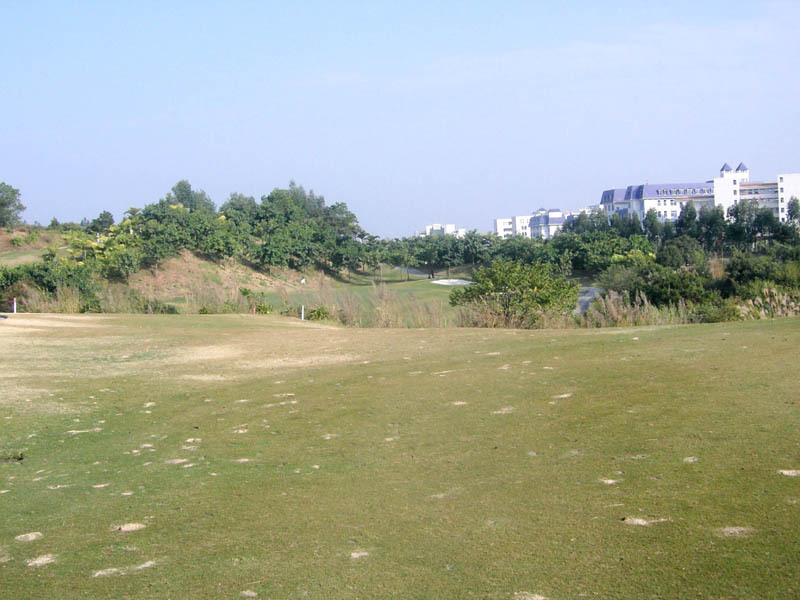 Many dogleg holes are well designed on the moderate uphill and downhill terrain. The landing areas are relatively narrow. So, it is quite a challenging course although the total yardage is only 6600 yards. A straight hole. Water on both sides comes into play on the tee shot and another water hazard lies 270 yards off the tee. The second shot is over water to the slightly elevated green that is deep and double-tiered. An uphill dogleg to the left. This is the most difficult hole. You need a 260-yard drive to reach to the flat fairway, otherwise your tee shot will stop somewhere in the middle of sharp slope and you will have no chance to hit the green. The second shot is over a ravine to the green surrounded by hazards. To play against a head wind, even a long hitter can’t hit the green on the second shot, so it is not a good layout. However, the view of the green and its surrounding trees is impressive. A par 3 with the green surrounded by water on 3 sides. It is downhill and not difficult but neat. A dogleg to the left with water along the entire left side. You should drive to the right side of the fairway as not only a lake but also a big bunker on the left of the fairway comes into play. The left of the green is bordered the lake, so be careful if you have a right to left approach shot. A sharp downhill par 3. The entire front side of the green faces a lake, so if you are short of the green, even a little, you will have a penalty. The right club selection is crucial on this hole, taking the sharp drop and the prevailing wind into account. A slight dogleg to the left. 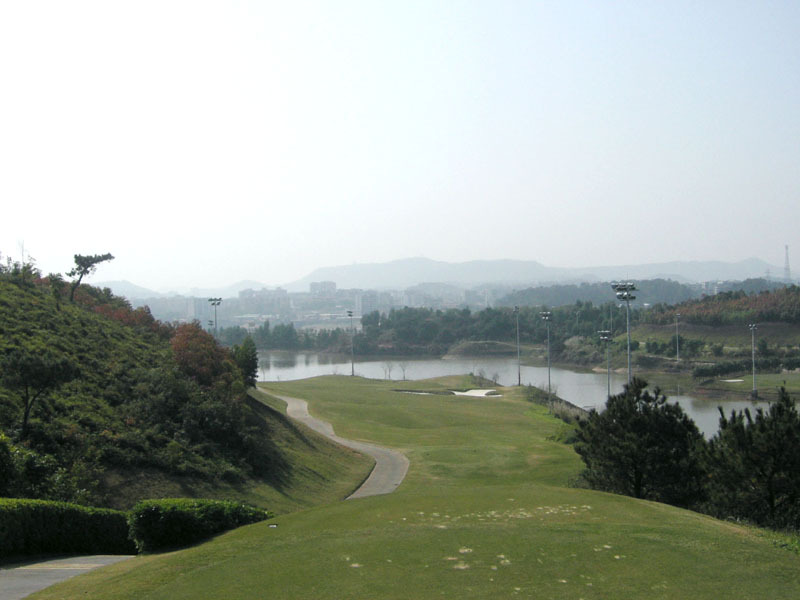 The landing area off the tee is tight with a lake on the left and a mountain on the right, so the tee shot is demanding. The lake will come into play on the second shot, too, because it protects the green on the right and at the back. The green is wide and triple-tiered. 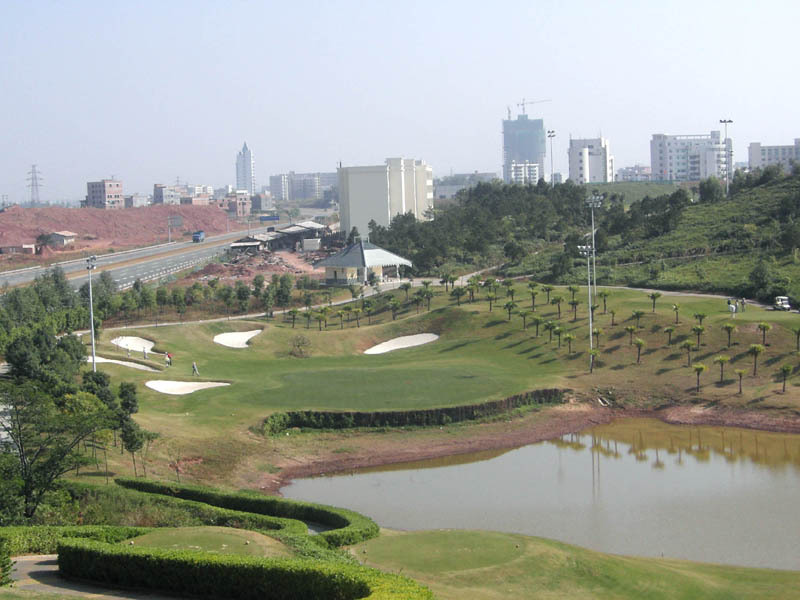 It takes 70 minutes from Shenzhen and 90 minutes from Guangzhou by car. The clubhouse is inside the impressive looking hotel. The bathroom is spacious with dry & wet saunas. 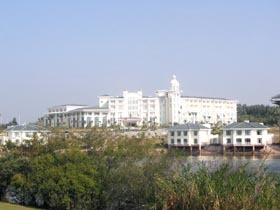 There are beautiful lake front villas in the course. The official length of this course is in fact 7013 yards from the black tees. However, you can’t play from the longest tee grounds, so I define the course length as 6593 yards, playing from the gold tees. The designer is a Malaysian Chinese.